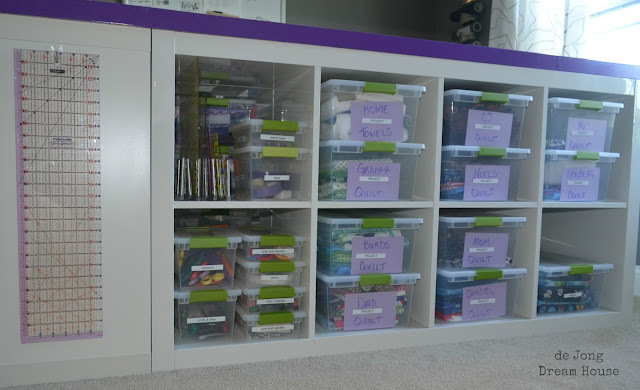 Here is a GREAT idea for a large craft table with lots of storage! Jen at de Jong Dream House is the mastermind behind this brilliant idea! She used some Expedits bookcases from Ikea and a door to create this beauty. I absolutely love how much storage space it created and how organized Jen is! To check out the complete tutorial of how she made this craft table, and to see for yourself how she organized it all, click HERE. That would make a rocking kitchen island as well, left open or maybe skirted in some manner. wonderful! Only thing I noticed that is any kind of drawback, is the table appears to be a little narrow – in order to be comfortable standing close to it there must be a toe kick, or overhang of about 3 inches on all sides that will be used. (think kitchen counters and the toe space at the bottom.) But can you imagine such a great storage and craft space! Great idea. I so want to do this now.. I was thinking of a cheaper but similar alternative, maybe buy about 16 plastic crates and a light weight/square top. Maybe four crates to each side and just place the top on it. This one is fantastic though, very, very nice! !